AON Invent is a highly rated invention service company that came into being as an outgrowth of All Product Design. For more than a decade, "APD", has provided full-service, consumer product design and engineering services to many of the area's estimated 1500 consumer goods manufacturers and suppliers who maintain offices in Northwest Arkansas, to better serve the world's largest retailer, Walmart. Once individual inventors discovered APD, they began hiring Andrew and his team to engineer their product concepts. They were always happy with APD's work, but after several years it occurred to Andrew that he had never seen any of their inventions on retail shelves. Being an inventor himself, he was familiar with the pitfalls of bringing a product to market, and he began to wonder if he was contributing to the problem by assuming their concepts were viable. ​In 2012 Andrew had a chance meeting with Larry Robertson, an entrepreneur whose career has spanned sales, marketing, and product innovation in the tech, retail, and financial sectors. 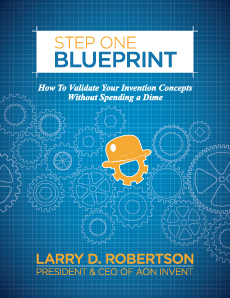 They discussed the state of the industry and what Larry calls the "innovation paradox". They also talked about how inventors are plagued by predatory business practices, where inventors are told what they want to hear in an effort to collect tens of thousands of dollars for weak ideas that little or no hope of ever being sold on retail shelves. It became clear that something had to be done, and a solution began to take shape. AON Invent was born. Andrew recognized that Larry's experience made him uniquely qualified to lead the company, given that he had already vetted hundreds of product concepts and marketing strategies. Together they created an efficient system for identifying a viable concept and getting it into the hands of companies that own shelf space in its related category. They spent the next year assembling a team of seasoned product experts who have acted as executive decision makers in hundreds of new product launches for retail, direct response, and direct-to-consumer companies that include Walmart, Sam's Club, and the Home Shopping Network. AON Invent is committed to providing each of their customers with an honest, inexpensive, professional assessment of their invention. We know that getting an idea onto the retail shelf is not an exact science, but a complicated and often frustrating challenge that no one can meet every single time. Our desire is to help inventors avoid wasting thousands of dollars on ideas that we believe are destined to fail, while helping commercially viable concepts get to market in the shortest period of time. In short, we are committed to being America's most highly rated invention service company. In order to do this, we realize we have to bring great ideas to consumer product companies in a format that eliminates the traditional inefficiencies and legal complexities that discourage those companies from working directly with inventors. To become America's Innovation Exchange & Depository by collaborating with the American consumer - the people who buy stuff, to create stuff people will buy.